This debut novel by Eric Lindstrom follows the journey of Parker Grant, a blind protagonist who is tired of being treated differently. Living with this disability has caused her to have to toughen up and as a result, she created the Rules: don’t treat her differently, never take advantage of her, and there’s no second chances. But when a boy from her past, who broke her heart, returns after many years, obeying these rules get harder and harder. Especially when the truth comes out about what really happened both with Scott and her recently deceased father, making her question the reality of what she knows. Eric Lindstrom is a veteran of the interactive entertainment industry, working as a creative director, game designer, and writer. 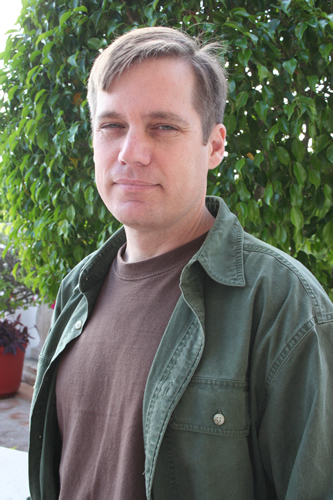 He’s been involved with video games such as Tomb Raider: Legend (where he received a 2006 BAFTA nomination for Best Video Game Screenplay) and Tomb Raider: Underworld (where he received a 2009 BAFTA nomination for Best Action Adventure Video Game and a 2009 Writers Guild of America (WGA) nomination for Best Writing in a Video Game.) Not If I See You First is his first novel, followed by A Tragic Kind of Wonderful. “Not If I See You First is thoughtful and honest, with characters that made me laugh, cry, and surprised me at every turn.” – Kody Keplinger, New York Times bestselling author of The DUFF and cofounder of Disability in KidLit. This novel by Michelle Zink is the first of a series featuring Grace Fontaine, a teen girl adopted into a family of thieves. This family of hers specializes in conning rich people out of their money, jewelry, art, and anything else they can. Like the first novel in this shipment, this family has its own set of rules: find a mark, run the con, and get out. No looking back. No attachments. Of course, this wouldn’t be an action-packed romance if Grace didn’t break these rules. The novel is set in Playa Hermosa, where the family is set to pull off their biggest heist yet. Things go wrong and when the family starts to crack under the pressure, Grace finds herself falling for her mark, and breaking more of the family rules. New York writer Michelle Zink has written many novels, including Prophecy of the Sisters (which was chosen as one of ALA Booklist’s Top Ten Novels for Youth in 2009 and as one of the Chicago Public Library’s Best Books for Young Readers), This Wicked Game, and the sequel to The Lies I Told: Promises I Made. “Fans of romance and a good heist will fall in love with Lies I Told. Action-packed,” – SLJ. Now let’s all sit down with a cold glass of iced tea, next to the window where we can bask in the bright sunlight and lose ourselves in love and adventure. Til next time!